In the first of a series of three public discussions, Rob Slifkin, an art historian from Reed College, and Studio Gorm, a product design team from University of Oregon, describe the writing and studio works they contributed to Call + Response, as well as their collaborative processes leading up to the final museum presentation. This program took place on July 25, 2009. Listen to the podcast. 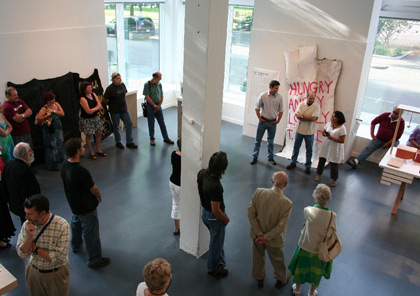 Karl Burkheimer, associate professor and head of the wood department, Oregon College of Art and Craft, and Matt Johnston, assistant professor, department of art, Lewis & Clark College, describe the writing and studio works they contributed to Call + Response, as well as their collaborative processes leading up to the exhibition. This program took place on August 27, 2009. Listen to the podcast.